Home » Behind the Scenes » Blog » What Are Those Cranes up To? Hey there, neighbor! These guys prefer open spaces such as residential neighborhoods. Sandhill cranes are iconic members of the Florida ecosystem. In fact, you may have even spotted one in your backyard or neighborhood. You might notice these long-necked birds hanging out in pairs as they approach an important time of the year for their species: breeding season. Two subspecies of this magnificent bird live in Florida: the Florida sandhill crane, which is a non-migratory, year-round breeding resident, and the greater sandhill crane, which spends its winters in the Sunshine State but nests in the northern United States. Much like many of us humans, members of this species often mate for life. In the early spring, single cranes headed to their breeding grounds will begin pairing up. To form a bond, male and female cranes will perform a unison calling (can you imagine if your most successful dating technique was yelling? ); once a pair forms a bond, it can last for years. During mating, sandhill cranes perform dancing displays which involve wing-flapping, bowing and jumping, among other behaviors. Though dancing is most common in the breeding season, cranes are known to dance throughout the year. 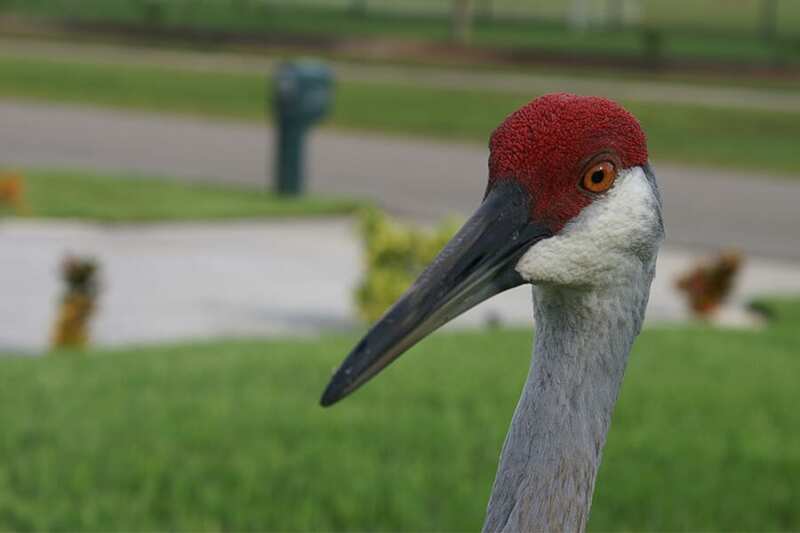 Florida sandhill cranes breed in open wetland habitats generally surrounded by trees or shrubs. Once they’ve established their territory, they’ll build a nest out of plant materials. The pair takes care of the nest together with the male standing guard. This species typically has two eggs, which take around a month to hatch. The chicks, called “colts,” are capable of following their parents away from the nest within 24 hours of hatching, and together forage for food like seeds, crop plants, insects and frogs. Sandhill crane populations decreased in the 20th century, due largely to habitat loss. Because they prefer open spaces, these birds are often present in suburban areas, airports and golf courses; thus, it is important to conserve wetlands to reduce the potential for conflict between our species. If you happen to encounter a pair of cranes in your neighborhood, remember to be courteous and give them their space.